Jupiter, the “King of Planets” is now at it’s highest point in the sky. The “King” crosses the meridian an hour after sunset. It’s easy to locate. 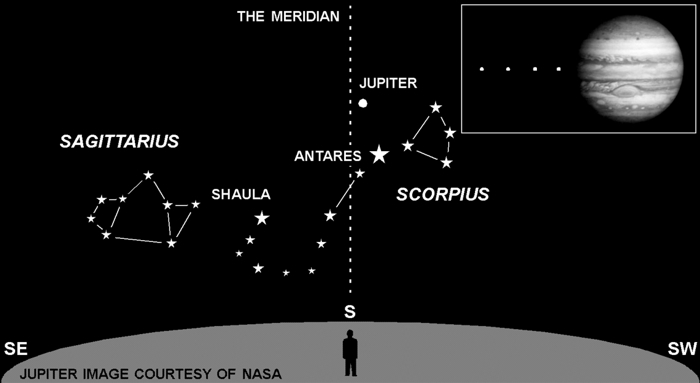 Look just above the bright star Antares in the constellation Scorpius. Your eye should be able to discern the striking color difference between these two celestial beacons. Jupiter appears bluish-white in color, Antares a dusky red. Of course, Antares is a star and makes its own light from the energy of nuclear fusion. Jupiter merely reflects light from our Sun, but it’s 7 million times closer than Antares. If you have binoculars, or a telescope, Jupiter will show some of the details visible in the inset. There are distinct bands of color girdling the orb. These are circulation systems not unlike our own jet streams. You’ll also see up to four of Jupiter’s moons, first discovered by Galileo in 1610. They won’t always be lined up all on one side, as shown, but they will be in a line that bisects the planet’s disc. The moons move visibly over a period of an hour, sometimes passing each other, sometimes moving behind Jupiter, and sometimes moving in front. It’s a celestial dance that unfolds before your eyes. Next Next post: Q&A: Pigs Can Fly!